In mid-2005 the MadCorp Ma-67 Scorpion attack helicopter first appeared in the skies over SW City, replacing the aging D-2 Striker? helicopters. The Ma-67 features a pair of counter-rotating rotors which provide balance to the helicopter without the need for a tail rotor. This allows it to operate much more quietly than conventional helicopters, good for night operations. Its two armament wings can carry a variety of weapons including unguided rockets, missiles which are aimed by sensors on the pilot's helmet, and the front-mounted chaingun which is designed to decimate both personnel and material targets. 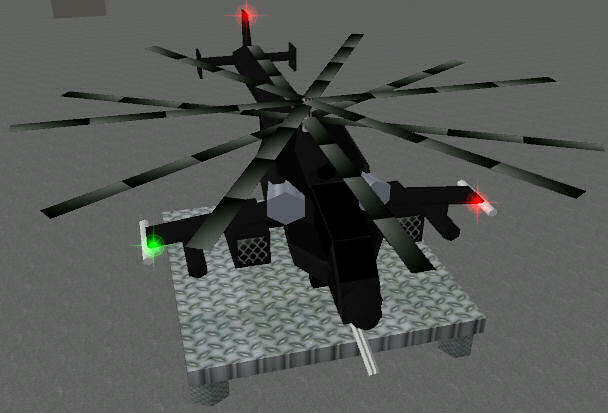 The helicopter is somewhat of a rare sight in the city, however, due to the secretive nature of the Swarmy air wing.